99 years of cherry blossoms: In 1912 Japan gifted America these Washington cherry trees as a symbol of friendship. Oops ... How about Pearl Harbor in 1941 and Hiroshima in 1945? Oh, well ... Apparently time does heal all wounds. Kansas lost to tiny VCU, after being knocked off last year by little UNI. The other Final Four teams are Connecticut, Kentucky and giant-killer Butler, again. ESPN had 5.9 million entries in its bracket contest. How many picked all four correctly? TWO. The sportsbook at the Las Vegas Hilton is sweating out the Final Four a little more than its Sin City counterparts. That's because a person put in a $10 bet at the sportsbook earlier this season on Virginia Commonwealth to win the national championship -- at 5,000 to 1. 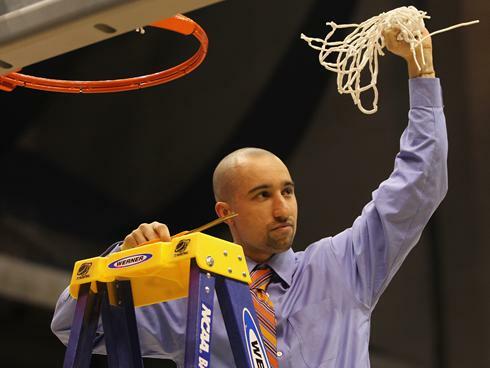 If Shaka Smart and the VCU Rams cut down the nets in Houston, several Las Vegas sportsbooks would take a hit. Should the Rams win two more games and cut down the nets in Houston, this particular fan will cash in a ticket worth $50,000. "My great-great uncle Bill counseled his grandson that if he wanted to live a long life, to sprinkle a pinch of gun-powder on his oatmeal every morning. The grandson did this religiously every day up to the age of 103 when he finally died. He left behind 14 children, 30 grandchildren 45 great-grandchildren, 25 great-great grandchildren, and a 15-foot hole where the local crematorium used to be." Bummers, Boys ... Minskirts are out this fall. Curly is also out. This lady spent two hours and $100 to be straight like this. Why? Get your order in now for a pair of these 2012 Porsche 918 Spyders at only $845,000 each. This chick magnet has 500 HP, top speed 199 mph, 0-62 in 3.2 seconds. "What format do you want me to save these in?" The 3.5 lb. Cravelle Jack pulled his kayak around for a bit. Our fine friend Shoultz is a retired teacher, former Marine, and 11-term Iowa House Representaive (D) who lost after 22 years ... to a Republican girl. The DC in Washington, DC stands for Dithering Congress ... And Ditherer-in-Chief. This header on the Michigan state website promises to cut red tape for new businesses. Hmm ... Is this another con job? Let's see now: The Census Bureau announced this week that Detroit lost 25% of its population in the past 10 years. From 951,000 to 713,000; down from 2 million in the 1950s. Maybe that's why businesses, like the local Red Robin restaurants, compared the 6-page business tax form for Ohio to Michigan's 270-page tax form and said they would not be expanding in Michigan. Fact. Of course, Ohio is no virgin either when it comes to losing jobs to Southern right-to-work states like Texas and the Carolinas. Ohio lost 525,200 jobs in the last decade. (Reuters) - Feb. 17 ~ North Carolina's Democratic governor on Thursday proposed eliminating more than 10,000 government jobs and cutting corporate taxes as part of a $19.9 billion state budget. In Detroit last week, they celebrated St. Patrick's Day by outlining the murder victims in green chalk. The 1933 double eagle (United States 20-dollar gold coin) currently holds the record for the second highest price paid at auction for a single U.S. coin when it was purchased for US $7.59 million. 445,500 specimens of this Saint-Gaudens Double Eagle were minted in 1933, the last year of production for the Double Eagle, but no specimens ever officially circulated and nearly all were melted down, due to the discontinuance of the domestic gold standard in 1933. Use your gold profits to buy a new Lamborghini for only $400,000, shown last week at the Geneva auto show. Or perhaps a prototype Pagani at $1.3 million. However, if your budget is a bit tight, you could get a good used car. This 1935 Auburn can be yours at auction for only $375 to $475K. Easy payment plan? Maybe not. Saved: Japanese man swept 8 miles out to sea on his roof. Each of these cargo containers washed up in Japan is about the size of a Greyhound bus. Adage: Pigs get fat, hogs get slaughtered. "My 75th birthday yesterday. Wife gave me an SUV". After a comprehensive education and career apprenticeship, Danilo established himself in Northeast Iowa as an award-winning talent in illustration and graphic design. He has done all of our work for over 25 years, thousands of projects, all with great skill and pride. In 2011, 40 years later, Danilo is just back from a Hawaiian vacation to celebrate his 60th birthday. See below, when he rented a bike for a tour of Maui. Where your editor got his start in Marketing, selling the Waterloo Daily Courier on Black's Dept. Store corner, Waterloo, Iowa in 1948. He also ventured over to the Illinois Central RR depot to sell papers up and down the isles aboard the trains. Cash business: bought the papers for 2.5 cents, sold for a nickel. 50% commision.. Tax free. Never, ever, swallow bubble gum. As soon as we know more, we'll pass it along. "Where are your manners, Lucy?" While on spring break last week, these three amateurs played five courses in lower Alabama and Panama City, FL, 27 holes per day. From left, your Follies editor Bob McCusker, Mr. Walt Graves of Atlanta, and Mr. Jim Wood of Dothan, AL. Shown here at the Auburn-Opelika, AL, Grand National course on the Robert Trent Jones golf trail. The gentlemen played a 4-day running "Skins" game with these final points: Wood 19, Graves 18, McCusker 14. So, Wood was the big winner, although McCusker had the lowest score for four of the five days. Perfect mid-70s temps every day for these lucky, seasoned players. Now, spring is in the air, let's open all the northern courses. Mr Buckles's daughter said that her father had died on Sunday at his farm in West Virginia.Mr Buckles, who celebrated his 110th birthday on Feb 1, lied about his age to join the US army at age 16. The Missouri native was among nearly 5 million Americans who served in World War One in 1917 and 1918. "I knew there'd be only one (survivor) someday. I didn't think it would be me," he said. Time for Wisconsin to arrest the 'Flee Party' Senators? Three of the worst fashions at the Oscars last Sunday. They should have shopped at Bloomingdales for these dresses below, only $244 to $660. How to REALLY simplify your wardrobe. "Hmm ... Let's see, is that aunt Aamaal on the left, then cousin Fareeda, then Kameela ... Or maybe that's sister Rasheeda?" Apparently, she spent it all on the dress. "The material we put into our stomachs is enough to have killed most of us sitting here, years ago.. Red meat is awful. Soft drinks corrode your stomach lining. Chinese food is loaded with MSG. High fat diets can be disastrous, and none of us realizes the long-term harm caused by the germs in our drinking water. However, there is one thing that is the most dangerous of all and we all have eaten, or will eat it. Can anyone here tell me what food it is that causes the most grief and suffering for years after eating it?" It wouldnt' be Friday without the Follies.